Enjoy the popular modern look in your bathroom with this beautiful vanity. Made with a special brown mdf base and a white acrylic counter, this piece will make your bathroom look even nicer. 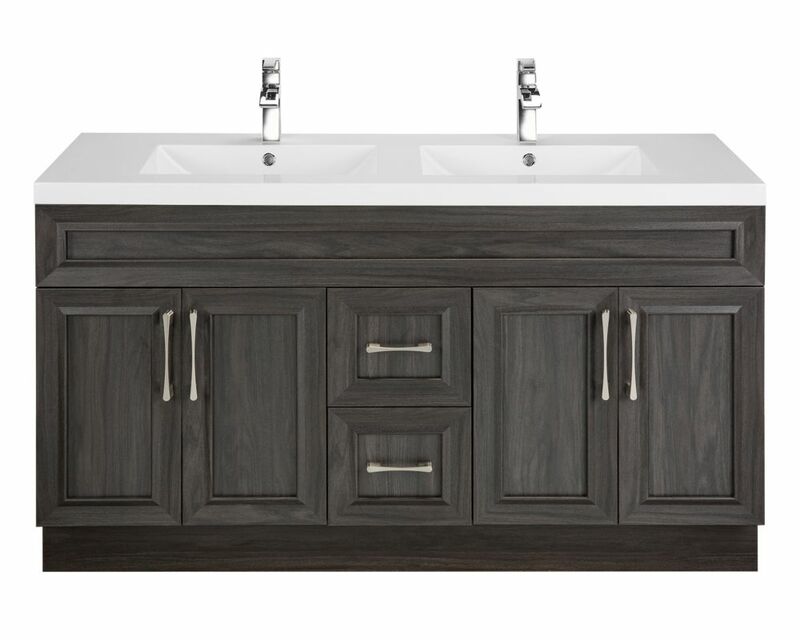 This simple vanity set from Cutler Kitchen Bath will fit right into any bathroom decor. Use this vanity to bring more modern style into your bathroom. The good-looking off-white quartz counter and grey solid wood base make a big difference in your bathroom. The simple look of the double-door cabinet and drawer is useful and classic. Add a classic feel to your bathroom with this simple vanity set from Art Bathe. Enjoy the popular modern look in your bathroom with this beautiful vanity. The off-white quartz counter and grey solid wood base make a beautiful look in your bathroom. Its double-door cabinet and drawers have lots of room to keep all of your bathroom items. Put a nice twist on your bathroom project with this classic piece from Art Bathe. For a bit of traditional style in your bathroom, choose this beautiful vanity. This piece comes with a beautiful brown plywood base and a white ceramic counter. The roomy double-door cabinet is great at storing your bathroom must-haves. Put together your perfect bathroom with this stylish vanity set from Bellaterra. Karoo Ash 60-inch W 2-Drawer 4-Door Vanity in Brown With Acrylic Top in White, Double Basins Enjoy the popular modern look in your bathroom with this beautiful vanity. Made with a special brown mdf base and a white acrylic counter, this piece will make your bathroom look even nicer. This simple vanity set from Cutler Kitchen Bath will fit right into any bathroom decor. Karoo Ash 60-inch W 2-Drawer 4-Door Vanity in Brown With Acrylic Top in White, Double Basins is rated 4.0 out of 5 by 1. Rated 4 out of 5 by erin006 from Looks classy Just installed this vanity in my bathroom. The top is beautiful and love the size of the sinks. No backsplash comes with it. I’m going to use a couple of rows of stone trim. The soft close doors work really nicely and there is lots of room for storage. It looks really beautiful. What colour is this vanity? The description says brown but the specifications says the cabinet colour is grey.